“Sacramental Vessels" by Banjo (a.k.a. Matthew Stroven) are at center stage, accompanied by works from Alex and Allyson Grey, Amanda Sage, Chris Dyer, Luke Brown, Ralph Steadman, MARS-1 and Rick Griffin. Glowing with light, Stroven’s glasswork art merges counterculture and fine art with nods to Aztec, Native American and Asian sources. These functional artworks are both spiritual objects and a stunning tribute to marijuana culture. 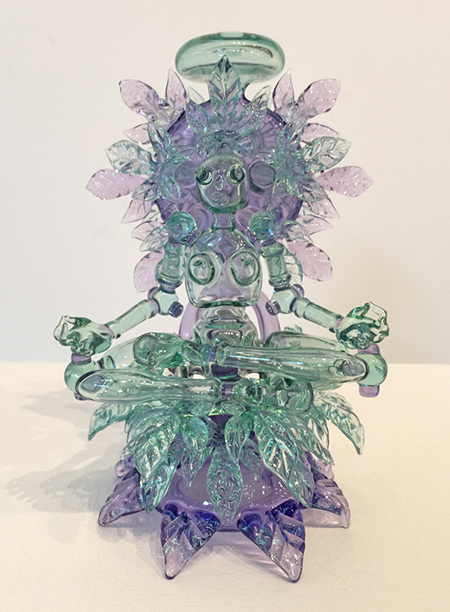 Intricate, dazzling with color and visionary in spirit, this is blown glass sculpture as psychedelic experience charged with a religious intensity. The works of Alex Grey are similarly mystical and magical, as in the icon-like imagery of the oil on wood panel “St. Albert and the LSD Revelation Revolution.” Allyson Grey’s “Aboriginal” is a series of hieroglyphic shapes created in acrylic on wood within a gold frame. Chris Dyer’s “DMT Diamond” features vivid, Aztec inspired patterns. Luke Brown’s “Visvarupa II (All Forms All Directions)” depicts a deity-like being against a blazing blue backdrop. Throughout the show, color and light are mind-blowingly bright, and the mesmerizing images bring us to inhabit the space more as participants than viewers.